NOTE: Managers can also create timesheets for all employees that aren't enabled for timesheets in their Employee File -> Pay Run Defaults page. To allow this feature, go to Payroll Settings -> Timesheets and tick the box that says 'Managers can create timesheets for all employees that aren't enabled for timesheets'. If the employee has not been enabled for timesheets (on their Pay Run Defaults page), a message will be shown and a link (if user is an admin) to enable the employee for timesheets. 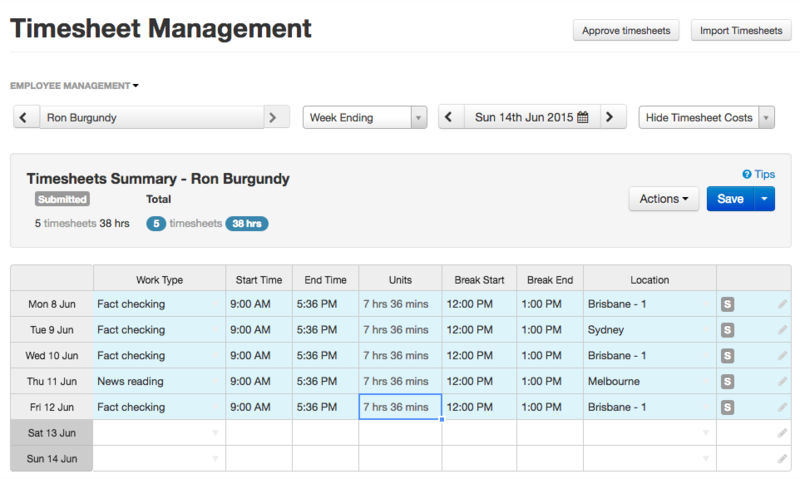 Doing so will show the controls to enable you to select the employee and date range for the timesheets. Choose from the list of locations that have been preselected for the employee. If the location is not specified, the hours recorded will be assigned to the default location for the employee when the timesheets are imported into a pay run.